Agave rigida var. sisalana (Perrine) Engelm., Trans. Acad. Sci. St. Louis 3: 316 (1875). Agave sisalana var. armata Trel., Mem. Natl. Acad. Sci. 11: 49 (1913). Agave sisalana f. armata (Trel.) Trel., Contr. U.S. Natl. Herb. 23: 118 (1920). Agave amaniensis Trel. & Nowell, Bull. Misc. Inform. Kew 1933: 465 (1933). Agave segurae D.Guillot & P.Van der Meer, Flora Montiber. 29: 30 (2005). Govaerts, R. et al. 2019. Agave sisalana in World Checklist of Selected Plant Families. The Board of Trustees of the Royal Botanic Gardens, Kew. Published on the internet. Accessed: 2019 Jan. 05.
International Plant Names Index. 2019. Agave sisalana. Published online. Accessed Jan. 05 2019. The Plant List 2013. 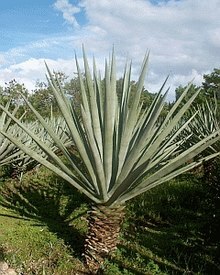 Agave sisalana in The Plant List Version 1.1. Published on the internet. Accessed: 2019 Jan. 05. Tropicos.org 2019. Agave sisalana . Missouri Botanical Garden. Published on the internet. Accessed: 2019 Jan. 05. USDA, ARS, Germplasm Resources Information Network. Agave sisalana in the Germplasm Resources Information Network (GRIN), U.S. Department of Agriculture Agricultural Research Service. Accessed on 08-Apr-12. Questa pagina è stata modificata per l'ultima volta il 5 gen 2019 alle 13:34.